Dr. Lisa Prusinski and Dr. Mark Vellan are Greenville chiropractors who serve both Greenville, Winterville and the surrounding areas in NC . Dr. Lisa Prusinski and Dr. Mark Vellan seek to improve their chiropractic patients' health and wellness in all areas of their lives. Dr. Lisa Prusinski and Dr. Mark Vellan like to treat the "whole person" in their work as chiropractors, which means looking for the underlying causes of disease, discomfort, and pain, which usually arise from imbalances in the spinal column. Under Dr. Lisa Prusinski and Dr. Mark Vellan's supervision and care, patients report higher functioning in all areas of their lives. 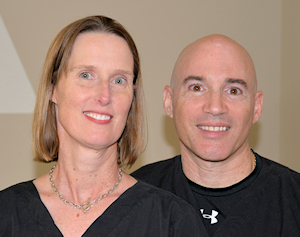 Dr. Lisa Prusinski and Dr. Mark Vellan have been serving the Greenville and Winterville, NC area since 1994. Spine Align Chiropractic Center was opened with the patient in mind. We strive to listen and improve the quality of healthcare to all current and potential patients. We treat a varied number of problems, from sports injuries, worker’s compensation, auto-accident cases. While we do treat specific symptoms such as headaches, TMJ problems, neck and back pain, radiating pain in the arms and legs, shoulder, elbow, wrist, hand, hip, knee and foot problems, fatigue, sleeplessness, carpal tunnel syndrome, mood swings, arthritis and fibromyalgia. Our main goals in practice are to help our patient’s focus on wellness and how to stay fit and healthy. We accomplish this through exercise, nutrition and stress management and promoting a healthy lifestyle. We believe that health and wellness are important at any age and we encourage the young, old and everyone in between to discover the benefits of chiropractic care for the whole family.